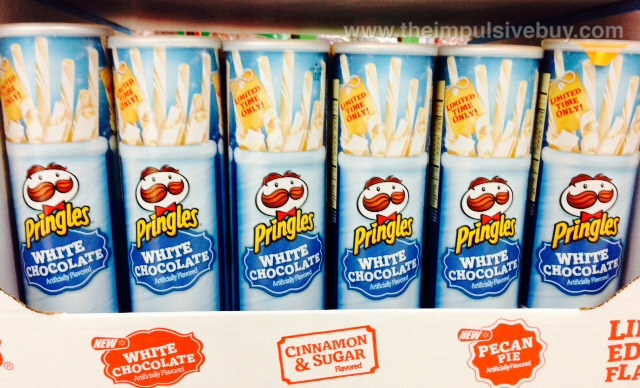 We never wanted or needed dessert Pringles, but they still exist, because the world is a cruel and unrelenting place. Last year, white chocolate peppermint chips invaded grocery shelves. Deciding that this wasn’t terrible enough, this year Pringles has brought us plain old white chocolate. Wait, I thought everything for Christmas had to be mint-flavored! One taster declared last year’s white chocolate mint flavor to be a “horrible abomination to humanity,” so we’re guessing that this artificially flavored concoction doesn’t have the same addictive appeal as this year’s other seasonal flavor, pecan pie. Even if you do like white chocolate (full disclosure: I don’t) do you care for artificial white chocolate flavoring powder on a potato chip? The last time that we polled our readership on this topic, you were almost evenly divided on the question, “Should dessert Pringles be a thing?” 50.9% of you said no, and 49.1% of you said yes.